SpatialOS, a platform from UK startup Improbable, is available now for game developers to create massive, densely detailed and persistent game worlds running on Google Cloud Platform. LONDON--(BUSINESS WIRE)--Improbable, the London-based startup which enables developers to build virtual worlds offering permanent, persistent and engaging gaming experiences, today announced a joint game developer program, the SpatialOS Games Innovation Program, with Google Cloud Platform. With this new program, Google and Improbable will partner to subsidise access for qualified developers to Improbable’s SpatialOS platform, a distributed operating system, powered by Google Cloud Platform, which enables the development of persistent online game worlds. Alongside this announcement, Improbable has launched its Game Developer Open Alpha for SpatialOS. Any game developer can get access to the SpatialOS platform and development tools, to test and experiment with it ahead of the full launch of the Games Innovation Program and the beta of SpatialOS in Q1 2017. SpatialOS gives any developer the ability to define and build simulated worlds which can accommodate thousands of simultaneous players in a single world at the same time, exceeding the usual limits of what a conventional game server can do. These simulations are persistent and support the kind of complex computation needed to bring new game ideas to life, while enabling a development methodology that supports extremely rapid iteration. Whether deployed on a single PC, a dedicated server or even the open cloud, games are currently hampered by low player numbers per instance, small environments and limited interaction with the world. Creating and running massive simulations that solve those problems on a public cloud requires a kind of distributed supercomputing - with potentially thousands of cores working together. This is what SpatialOS makes possible, by distributing work automatically and intelligently across hundreds or thousands of servers. The other great challenge to game design is creative. Building games at this scale requires a whole new approach to game design. “Imagine a virtual city populated by players, who can make lasting changes to its social structure or its economy through their actions,” said Narula. “Or a battle between thousands of players, played out in real time over days or weeks. These are possibilities that demand a totally different approach. SpatialOS lets developers rapidly deploy and test these new game ideas and begin live testing with users from a much earlier stage, enabling them to gather feedback much faster than before. The Games Innovation Program also helps ensure that developers don’t have to worry about some of the costs of game development. These new kinds of games are also likely to benefit significantly from advances in machine learning, artificial intelligence and virtual reality interfaces - all technologies where Google is a leader. Under the program, eligible game developers will be provided with Improbable Credits, which can be used to pay SpatialOS usage fees, which include the costs of hosting games on GCP. The program will cover the cloud costs of developing, testing and deploying games using SpatialOS right up to when the game is launched. Developers can sign up for the Experimental Game Developer Alpha of SpatialOS at spatialos.com, and start developing immediately, or get more information from this blog post by Herman Narula. For more information on the SpatialOS Games Innovation Program, the SpatialOS open alpha for game developers, or Improbable, please contact press@improbable.io. By building on SpatialOS, developers can use standard tools and game engines to build new gaming experiences supported by the reliability, processing power and flexibility of Google Cloud Platform. SpatialOS lets a developer exceed the limits of a single server or game engine. It allows for a swarm of hundreds of game engines, running in the cloud, to cooperate together to simulate a world much larger, richer, and with more players than any single one could. Because SpatialOS manages the state of the world, every object in the world can persist indefinitely, removing the traditional constraints of game engines. Game worlds can now have a meaningful history, and players can leave a lasting impression. An item dropped on the ground can persist for years. Rather than having to build server infrastructure, a developer can deploy their project to the SpatialOS Platform with a handful of CLI commands, minutes after starting it, and begin sharing with others. This allows for an online game world to be built and iterated rapidly in the presence of players. A game developer can spend their time on what they want to do: creating and growing their game world and its story, rather than building and maintaining server infrastructure. Developers can create massive, ambitious games with far smaller teams. SpatialOS takes advantage of key features of Google Cloud Platform to offer developers an exceptional development environment. The low latency frontend peering of Google Cloud Platform helps provide stable experience for games thanks to Google’s private backbone network. Google Cloud Datastore’s fully managed NoSQL database is inherently highly available and scales to handle millions of reads/writes allowing Improbable to improve SpatialOS while Google Cloud Platform handles the crucial database configuration. Google Cloud Storage’s globally available solution is fully redundant by default which can translate to costs savings and is great for storing the large game snapshots from SpatialOS. Google Compute Engine’s instance uptime and live migration helps minimise the number of game server rebalancing failovers, contributing to the smooth experience of running large scale simulations. Compute Engine’s instance provisioning speed allows Improbable to dynamically grow the number of machines available to developers on the platform, without the need to pre-reserve instances. Compute Engine’s internal networking provides throughput and low latency, enabling rapid exchanges of state across multiple machines contributing to a game simulation. The high IOPS (input/outputs per second) of Google Compute Engine’s SSD storage suits the requirements of gaming built on SpatialOS. SpatialOS is already being used by game developers to create new gaming experiences. Two early examples are Worlds Adrift from Bossa Studios and Lazarus from Spilt Milk Studios, both currently in advanced stages of development. Worlds Adrift is a 3D physics-driven sandbox MMO set in a shattered world of floating islands. Thousands of players share a single world, in an environment currently covering more than 1000km², and continuing to grow. These players can form alliances, build sky-ships and become scavengers, explorers, heroes or sky-pirates in an open, interactive world where actions have real consequences. Ships can be stolen, wrecks can be scavenged and each island’s forests and animal life can flourish or diminish over time. Worlds Adrift is scheduled to launch in closed early access in Q1 2017. More information can be found at www.worldsadrift.com. Lazarus, a retro-styled top-down space shooter, features a 160,000 km2 map where thousands of players can fight alien invaders, and each other. Developed by Spilt Milk Studios with a four-person team, after only three months of development Lazarus is now in continuous open development; anyone can sign up for a free Steam code at http://www.playlazarus.com. Simple accessible gameplay gives way to a complex dynamic wargame in which AI factions fight for territory with up to three thousand simultaneous human players in a single world. 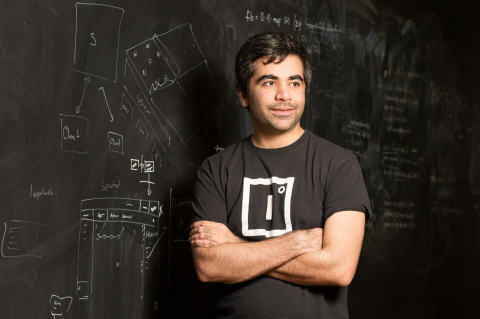 Headquartered in London, Improbable is a technology company dedicated to building technology to enable powerful virtual worlds and simulations designed to help solve previously intractable problems. In gaming and entertainment, this enables the creation of richer, more immersive and persistent virtual worlds. The Company’s proprietary platform SpatialOS is now available as an alpha release for games development teams of all sizes. Founded in 2012, Improbable received $20m in Series A funding from Andreessen Horowitz in March 2015. Gaming and entertainment studios currently building their products on SpatialOS include Bossa Studios (Worlds Adrift), Spilt Milk Studios (Lazarus), HelloVR (MetaWorld), Entrada Interactive (Rebel Horizons) and Soulbound Studios (Chronicles of Elyria).